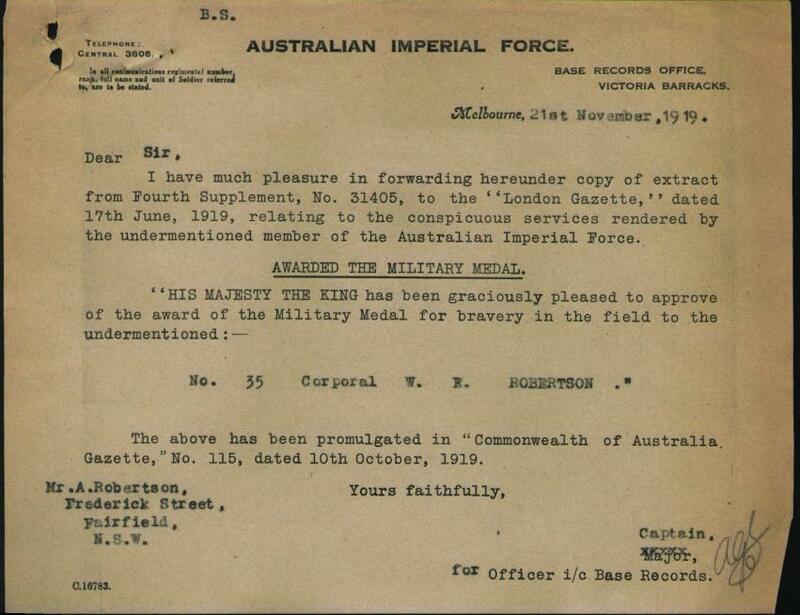 Over 100 years ago this young man from Gladesville in Sydney, enlisted in the Australian Imperial Forces. He came from a large family with two older brothers and four sisters. His mother had passed away just 7 months prior to his enlistment. Sidney felt it was his duty to respond to the call to war and he didn’t hesitate. Sidney was a gallant first day lander and a member of the sapper team that heroically rowed ashore dodging heavy shrapnel fire all the way and constructed the barrel piers on landing day at Gallipoli. Walter was a 27 year old “rough carpenter” or “bush carpenter” a familiar phrase in Australia and New Zealand 100 years ago. Bush carpentry was very different to the carpentry we know today, with most of the timber cut on the property and worked by hand with axe, saw, wedge, mallet, auger and chisel. The houses, sheds, wagons and even tools were made from the local available materials such as tree trunks , saplings, fencing wire, metal scraps and anything that could be recycled such as metal drums etc. 104 James Percival Polley, was another experienced “Bush carpenter” who had been pliing his trade for 9 years. They were among the handiest men to have around at Gallipoli and the front. The rough carpenter was very skilled, a man clever with his hands, methodical in his approach to work, able to improvise, very confident and always willing to learn new skills. Walter was one of these men, a man not out of place even today. He was born in Stratford, Victoria but was living and working his skills in New South Wales. 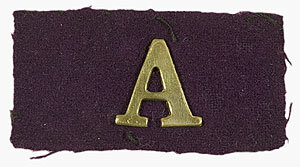 His father, Archibald, his next of kin on his enlistment papers was living at Fairfield NSW. Walter was wounded in Gallipoli, gunshot wounds to the hand and head on the 28th June 1915. His casualty is mentioned in the Unit diaries AWM4 – June 1915. He convalesced at Hospital in Mena, Egypt and when fully recovered he returned to Gallipoli in September and remained until the company was evacuated. In March 1916 Walter was transferred to the 15th FCE and it wasn’t long before Walter was among the action on the front line at the Western front, where again he was wounded in action on 20th July 1916, a gun shot wound to his right arm and left leg. Walter returned to Australia safely on the HMAT “Devon” on the 24th November 1918. Walter died suddenly in 1944 on 11th April 1944, he was 56 years of age. The Returned Soldiers League of Cobar managed his funeral arrangements and he was later buried at Cobar Shire Cemetery, New South Wales, Australia. Walter was survived by one brother Neil Robertson and his five sisters. 344 Spr. Edward Moore Carter – not an “original” however equally remembered. 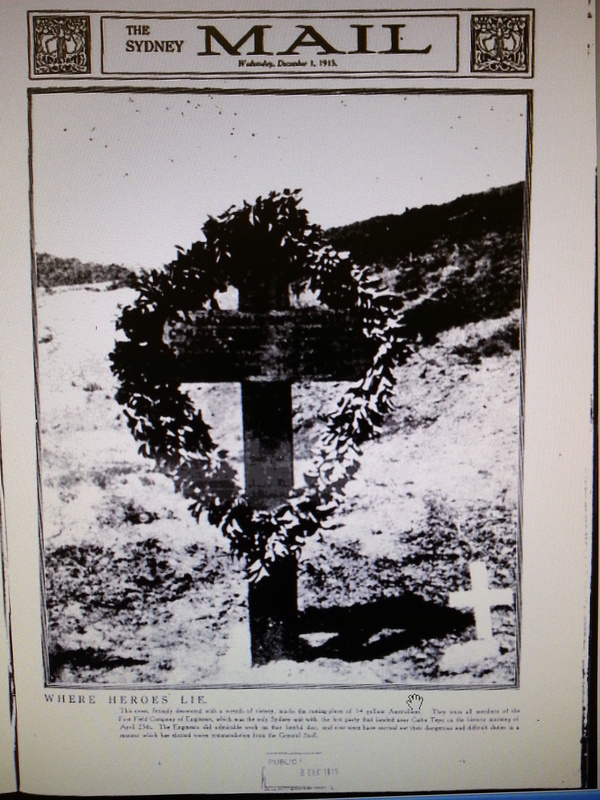 According to an article on 7th October 1916 in The Globe and Sunday Times War Pictorial this cross was erected and the names cut on it by Sapper 149 Charles Akins, an original member who also made the wreath and left it on the cross before he left Gallipoli. “Relatives of these soldiers may secure a copy of the photo by communicating with Mrs. Akins, of 30 Burton-street, Darlinghurst, East Sydney”. Not all the men named on the cross were actually buried here and as each of their stories unfold it also explains their final day at Gallipoli. 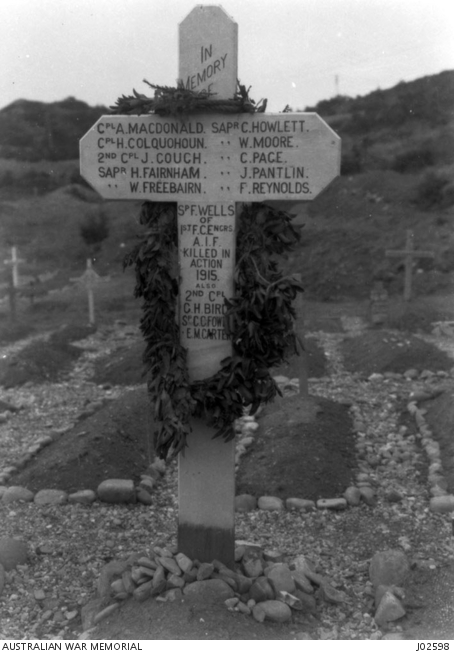 The cross was later considered a memorial cross and this famous Gallipoli image of the cross was later replaced by a new cross and amended to read… “ Unknown Australian Soldier”. Cleveland Page photo – Courtesy Catherine Job , Page family collection.